listen), French: Anvers French pronunciation: [ɑ̃vɛʁ(s)]) is a city in Belgium, and is the capital of Antwerp province in Flanders. With a population of 520,504, it is the most populous city proper in Belgium, and with 1,200,000 the second largest metropolitan region after Brussels. In the 16th century, Antwerp was noted for the wealth of its citizens ("Antwerpia nummis") . The houses of these wealthy merchants and manufacturers have been preserved throughout the city. However, fire has destroyed several old buildings, such as the house of the Hanseatic League on the northern quays, in 1891. During World War II, the city also suffered considerable damage by V-bombs, and in recent years, other noteworthy buildings were demolished for new developments. nl (Delwaidedok) terminal at the Port of Antwerp. 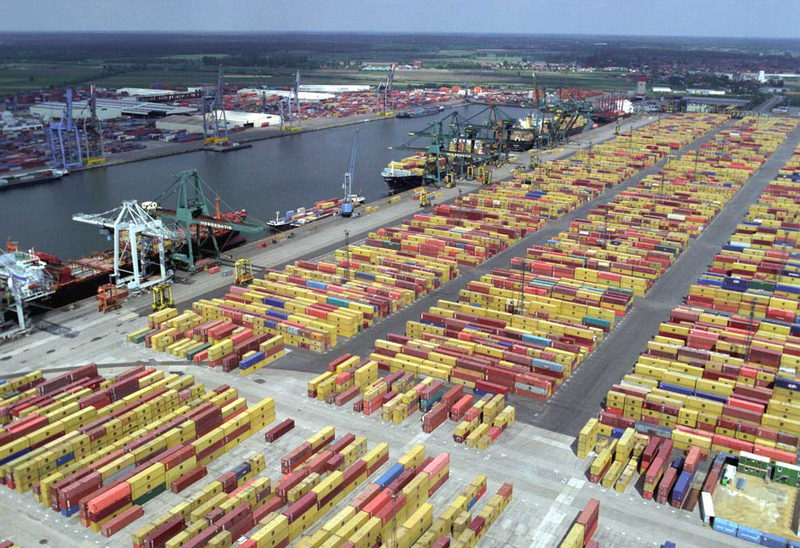 According to the American Association of Port Authorities, the port of Antwerp was the seventeenth largest (by tonnage) port in the world in 2005 and second only to Rotterdam in Europe. Importantly it handles high volumes of economically attractive general and project cargo, as well as bulk cargo. Antwerp's docklands, with five oil refineries, are home to a massive concentration of petrochemical industries, second only to the petrochemical cluster in Houston, Texas. Electricity generation is also an important activity, with four nuclear power plants at Doel, a conventional power station in Kallo, as well as several smaller combined cycle plants. There is a wind farm in the northern part of the port area. 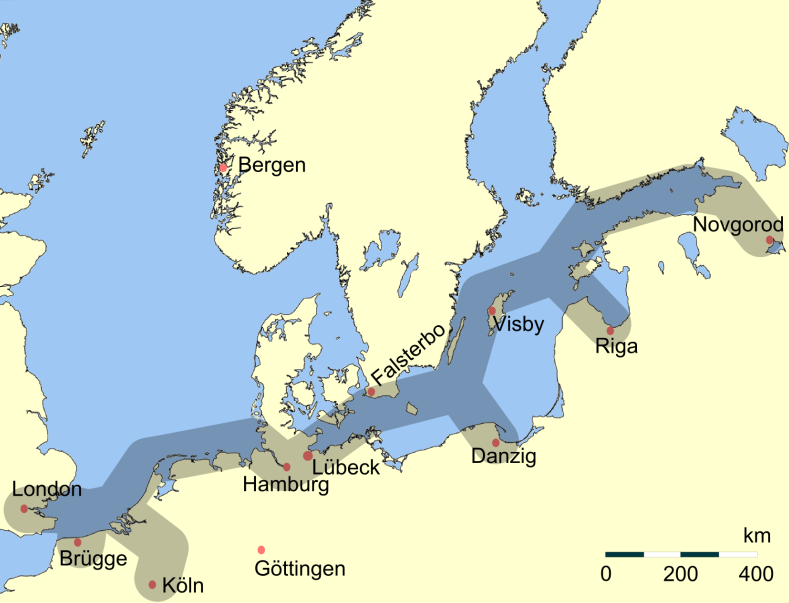 There are plans to extend this in the period 2014–2020. The old Belgian bluestone quays bordering the Scheldt for a distance of 5.6 km (3.5 mi) to the north and south of the city centre have been retained for their sentimental value and are used mainly by cruise ships and short sea shipping. The current city council was elected in the October 2012 elections. October 2018 elections have resulted in a deadlock where the current Mayor Mr Bart De Wever has an option of leading a coalition with only the Groen party, or with a multi party coalition with the Open-Vld, CD&V and Sp.a parties. The current majority consists of N-VA, CD&V and Open Vld, led by mayor Bart De Wever (N-VA). ^ Statistics Belgium; Loop van de bevolking per gemeente (excel-file) Population of all municipalities in Belgium, as of 1 January 2017 (2017-01-01). Retrieved on 1 November 2017. ^ "De Belgische Stadsgewesten 2001". Statistics Belgium. Archived from the original on 29 October 2008. https://web.archive.org/web/20081029020131/http://www.statbel.fgov.be/pub/d0/p009n014_nl.pdf. Retrieved 19 October 2008. Definitions of metropolitan areas in Belgium. ^ "Antwerp is Europe's second largest port". 9 November 2016. https://www.flandersinvestmentandtrade.com/invest/en/news/antwerp-europe%E2%80%99s-second-largest-port. ^ "The World According to GaWC 2012". Globalization and World Cities (GaWC) Study Group and Network. Loughborough University. http://www.lboro.ac.uk/gawc/world2012.html. Retrieved 9 December 2014. ^ "A look inside one of the world's oldest stock exchange buildings". http://www.barcroft.tv/antwerp-stock-exchange-building-belgium-europe-brussels. One or more of the preceding sentences incorporates text from a publication now in the public domain: Chisholm, Hugh, ed (1911). "Antwerp (city)". Encyclopædia Britannica. 2 (11th ed.). Cambridge University Press. pp. 155–156. ^ Isidore Singer and Cyrus Adler, eds. (1916). The Jewish Encyclopedia. pp. 658–60. https://books.google.com/books?id=47o5AQAAMAAJ&pg=PA658. ^ Pelle, Kimberley D. Findling, John E. ed. Encyclopedia of World's Fairs and Expositions. McFarland & Company, Inc. p. 414. ISBN 978-0-7864-3416-9. ^ "KBC Tower - The Skyscraper Center". http://www.skyscrapercenter.com/building/kbc-tower/5086. ^ "Antwerp timeline 1300–1399". Strecker.be. Archived from the original on 7 May 2008. https://web.archive.org/web/20080507100209/http://www.strecker.be/2004/kroniek/kroniek-a_002.htm. Retrieved 13 April 2010. ^ "Antwerp timeline 1400–1499". Strecker.be. Archived from the original on 10 May 2008. https://web.archive.org/web/20080510113511/http://www.strecker.be/2004/kroniek/kroniek-a_003.htm. Retrieved 13 April 2010. ^ a b "Antwerp timeline 1500–1599". Strecker.be. Archived from the original on 2 May 2008. https://web.archive.org/web/20080502104212/http://www.strecker.be/2004/kroniek/kroniek-a_004.htm. Retrieved 13 April 2010. ^ Boumans, R; Craeybeckx, J (1947). Het bevolkingscijfer van Antwerpen in het derde kwart der XVIe eeuw. T.G.. pp. 394–405. ^ (1961) "Anvers aux XVe et XVIe siècles : expansion et apogée". Annales. Économies, sociétés, civilisations 16 (2). Retrieved on 12 December 2014. ^ "Antwerp timeline 1600–1699". Strecker.be. Archived from the original on 7 May 2008. https://web.archive.org/web/20080507083302/http://www.strecker.be/2004/kroniek/kroniek-a_005.htm. Retrieved 13 April 2010. ^ "Antwerp timeline 1700–1799". Strecker.be. Archived from the original on 4 August 2008. https://web.archive.org/web/20080804093815/http://www.strecker.be/2004/kroniek/kroniek-a_006.htm. Retrieved 13 April 2010. ^ "Antwerp timeline 1800–1899". Strecker.be. http://www.strecker.be/2004/kroniek/kroniek-a_007.htm. Retrieved 13 April 2010. ^ "Antwerp timeline 1900–1999". Strecker.be. Archived from the original on 7 January 2008. https://web.archive.org/web/20080107091927/http://www.strecker.be/2004/kroniek/kroniek-a_008.htm. Retrieved 13 April 2010. ^ Auteur: Dajo Hermans. "56 procent van Antwerpse kinderen is allochtoon – Het Nieuwsblad". Nieuwsblad.be. http://www.nieuwsblad.be/article/detail.aspx?articleid=GEL2M0RO6. Retrieved 12 March 2013. ^ "Antwerpen in 2020 voor 55% allochtoon" (in nl). Express.be. http://www.express.be/joker/nl/brainflame/antwerpen-in-2020-voor-55-allochtoon/126467.htm. Retrieved 12 March 2013. ^ "An Introduction to Jainism: History, Religion, Gods, Scriptures and Beliefs". Commisceo Global. http://www.commisceo-global.com/component/easyblog/a-brief-introduction-to-jainism. Retrieved 5 May 2012. ^ Daneels, Door Gilbert Roox, foto's Wim. "Diamant met curry" (in nl-BE). De Standaard. http://www.standaard.be/cnt/g17tci9b. ^ Vanneste, Tijl (6 October 2015). "Global Trade and Commercial Networks: Eighteenth-Century Diamond Merchants". Routledge. https://books.google.it/books?id=pOo5CgAAQBAJ&printsec=frontcover&dq=Global+Trade+and+Commercial+Networks:+Eighteenth-Century+Diamond+Merchants&q=Global+Trade+and+Commercial+Networks:+Eighteenth-Century+Diamond+Merchants. ^ "Antwerp and diamonds, the facts - Baunat Diamonds". http://www.baunatdiamonds.com/en/faq/facts-figures-antwerp-and-diamonds. ^ "THE ARMENIAN OF BELGIUM: AN UNINTERRUPTED PRESENCE SINCE THE 4TH CENTURY". http://agbu.org/news-item/the-armenian-of-belgium-an-uninterrupted-presence-since-the-4th-century/. ^ "Armenia: Report On Kotayk Province". WikiLeaks. 26 August 2011. http://www.cablegatesearch.net/cable.php?id=03YEREVAN2992. Retrieved 14 November 2012. ^ "Wind farm | Sustainable Port of Antwerp". http://www.sustainableportofantwerp.com/en/content/people/wind-farm. Retrieved 2 August 2015. ^ John Tagliabue (5 November 2012). "An Industry Struggles to Keep Its Luster". The New York Times. https://www.nytimes.com/2012/11/06/world/europe/antwerps-diamond-industry-tries-to-keep-its-luster.html. Retrieved 6 November 2012. ^ "The industry | Antwerp World Diamond Centre". awdc.be. Archived from the original on 26 June 2015. https://web.archive.org/web/20150626114400/https://www.awdc.be/en/industry. Retrieved 2 August 2015. ^ a b "WSJ: Indians Unseat Antwerp's Jews As the Biggest Diamond Traders". Stefangeens.com. 27 May 2003. http://www.stefangeens.com/wsj.html. Retrieved 15 September 2011. ^ ""Your VLM contacts."". Archived from the original on 1 August 2003. https://web.archive.org/web/20030801135911/http://www.vlm-airlines.com/contacts.asp. Retrieved 29 March 2017. VLM Airlines. 1 August 2003. Retrieved on 6 July 2010. "Headquarters VLM Airlines Belgium NV Luchthavengebouw B50 B 2100 Deurne Antwerpen." ^ "Our Offices Script error." CityJet. Retrieved on 6 July 2010. "Antwerp office VLM Airlines Belgium NV Luchthavengebouw B50 B 2100 Antwerp Belgium Company registration number 0446.670.251." ^ "Archived copy". Archived from the original on 3 December 2002. https://web.archive.org/web/20021203101859/http://www.delseyairlines.com/home/view/index.cfm?id=151&l=1. Retrieved 3 December 2002. Delsey Airlines. 3 December 2002. Retrieved on 8 September 2010. ^ "Statistiques climatiques des communes belges: Antwerpen (ins 11002)" (in French). Royal Meteorological Institute of Belgium. Archived from the original on 25 January 2017. https://web.archive.org/web/20170125023508/http://www.meteo.be/resources/climateCity/pdf/climate_INS11002_ANTWERPEN_fr.pdf. Retrieved 25 January 2017. ^ "Verenigingen gevestigd in "Den Bengel". ANTWERPSE JAZZCLUB". 27 February 2016. http://www.denbengel.be/Jazz_New.html. ^ "Gratis klassiek festival in Antwerpen" (in nl-BE). De Morgen. https://www.demorgen.be/muziek/gratis-klassiek-festival-in-antwerpen-b7d01bfd/. ^ http://www.103.be,+Firma 103 -. "cultuurmarkt van vlaanderen - nieuws" (in en). http://www.cultuurmarkt.be/2018/. ^ "Linkerwoofer" (in en). https://www.visitantwerpen.be/en/linkerwoofer-en. ^ "stubru.be/agenda/linkerwoofer0" (in nl). https://stubru.be/agenda/linkerwoofer0. ^ "Double gold for next host country of the World Choir Games 2020". interkultur.com. https://www.interkultur.com/newsroom/choir-games/details/news/double-gold-for-next-host-country-of-the-world-choir-games-2020/. ^ "Cycling at the 1920 Antwerpen Summer Games: Men's Road Race, Individual | Olympics at Sports-Reference.com". sports-reference.com. https://www.sports-reference.com/olympics/summer/1920/CYC/mens-road-race-individual.html. Retrieved 2 August 2015. ^ "ROYAL ANTWERP FOOTBALL CLUB". Archived from the original on 3 July 2013. https://web.archive.org/web/20130703110239/http://www.rafc.be/eng/index2.html. Retrieved 3 June 2017. ^ "Tour de France 2015 : de l'eau, et du diamant" (in fr). letour.fr. 24 May 2014. http://www.letour.fr/le-tour/2014/fr/avant-course/actus/ahc/tour-de-france-2015-de-l-eau-et-du-diamant.html. Retrieved 24 May 2014. ^ "Akhisar Belediyesi - ATİK - UEMP". http://www.uemp.eu/tr/belediye/akhisar-belediyesi. ^ Grossblat, R.M. (15 July 2010). "Simon Korblit, a Profile Tribute". Atlanta Jewish News. http://www.atlantajewishnews.com/newsarticles/simon-korblit-profile-tribute. Retrieved 23 July 2010. This page uses content from the English language Wikipedia. The original content was at Antwerp. The list of authors can be seen in the page history. As with this Familypedia wiki, the content of Wikipedia is available under the Creative Commons License.